Community Eye Health Journal » What is comprehensive school eye health? Comm Eye Health Vol. 30 No. 98 2017 pp 21-25. Published online 07 September 2017. Education has the potential to change individuals’ lives and fuel social transformation. There is a strong link between children’s health, including their visual health, and the quality of their learning and achievement at school. This, in turn, affects children’s future quality of life and economic productivity. School eye health programmes provide a unique opportunity to deliver comprehensive eye health services to school-going children. Comprehensive school eye health programmes are not just about URE, but can also have a positive impact on locally endemic diseases such as vitamin A deficiency or trachoma. School eye health programmes should also include identifying and referring children with other eye conditions such as strabismus or lens opacities. Health promotion and education in schools can reduce the spread of epidemic diseases such as viral conjunctivitis and reduce the risk of eye injuries. The eye health of teachers can also be addressed by detecting and managing any refractive errors, including presbyopia. 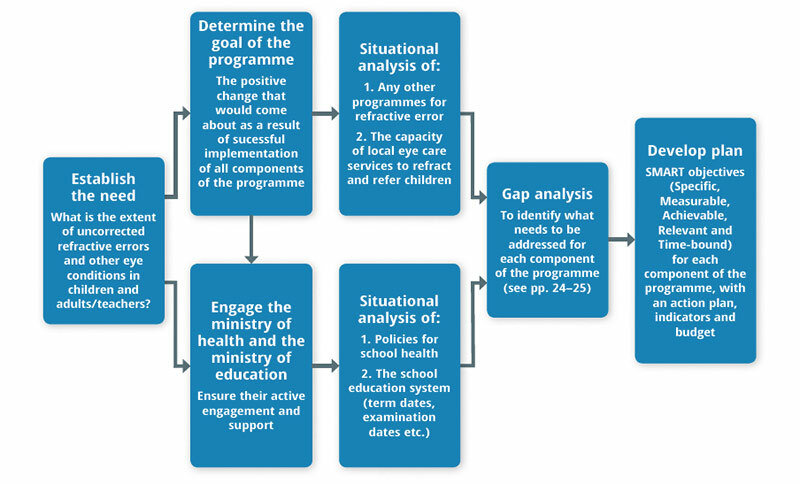 The steps involved in developing a plan are shown in Figure 1. The United Nations Convention on the Rights of the Child (UNCRC) recognises that children have rights of their own: the right to health, including treatment of illness and rehabilitation, a right to education and a right to an adequate standard of living. Poor eye health affects the realisation of these rights. UNCRC provides a mandate for communities, civil society and governments to come together to address child eye health. Goal 8: Ensuring economic growth through the provision of good jobs. 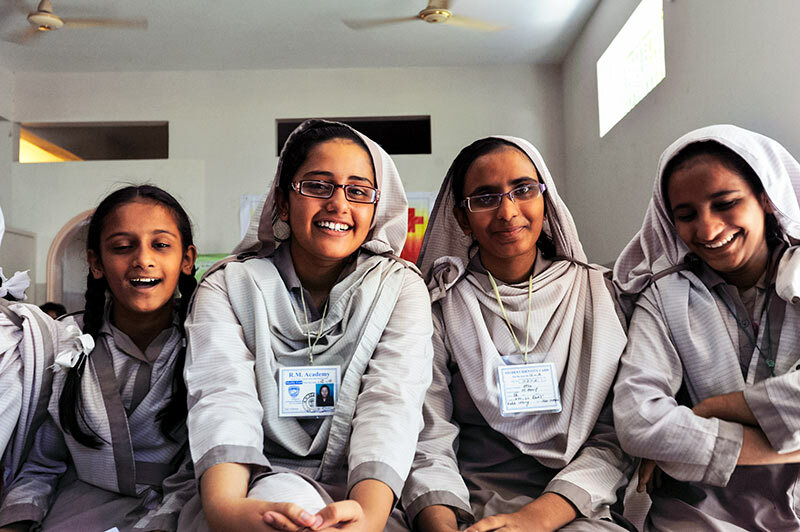 Many school eye health initiatives are narrow in focus, do not involve ministries of health or education and are not integrated into other school health initiatives. Often, they do not provide periodic vision screening to identify new cases, nor follow up children previously identified with myopia (which can progress with age). These factors can lead to poor co-ordination, lack of ownership and affect the sustainability of programmes. Another challenge is the inadequate monitoring and evaluation of school eye health initiatives. This can lead to inefficiencies, with poor assessment of outcomes and impact. 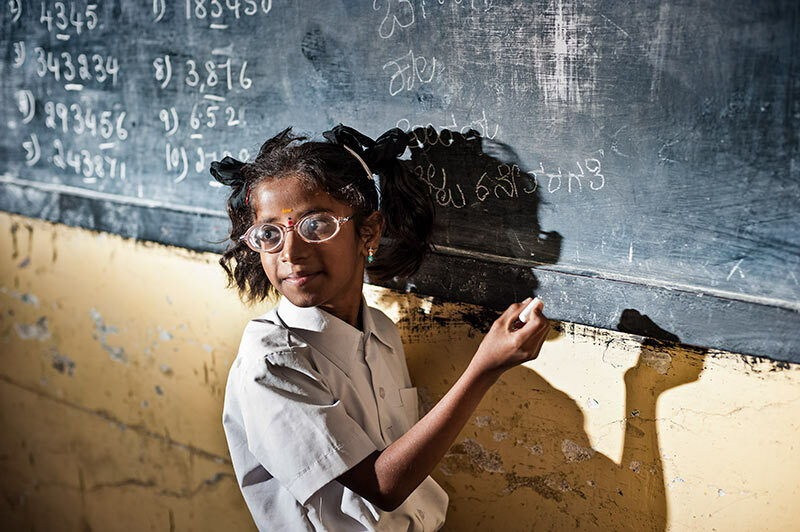 There is evidence that a high proportion of children given spectacles do not wear them for a range of reasons, many of which could be minimised or overcome by educating parents, teachers, the children affected and their peers. Spectacle wear can be increased by dispensing spectacles only to children who really need them (see article on p. 31) and by ensuring that comfortable, cosmetically acceptable spectacles are provided free or at a minimal cost. Several of these topics are addressed in this issue. Correction of refractive error and provision of affordable, durable spectacles that are comfortable and look good. Provision of reading spectacles for presbyopia in teachers, if required. Health education to prevent locally endemic diseases in children, e.g. face washing to promote a clean face to prevent trachoma and/or good nutrition to prevent vitamin A deficiency. Promoting a clean, safe and healthy school environment, e.g. growing vitamin A-rich foods in a school garden, collecting water for face washing and avoiding games with sharp objects. Encourage children to take eye health messages home. They can act as ‘case detectors,’ identifying people in their community who need eye services. See www.childtochild.org.uk for more information. The health education component of school eye health should be delivered by qualified eye care professionals, such as nurses or clinical officers, at a level that children can understand. The purpose of health education is to increase children’s knowledge about the eye, how it works and what can go wrong (in simple language), and to tell them how they can keep their own eyes healthy. Ideally, this should be an integral component of the school curriculum. It is desirable that the ministry of health provides financial support for programmes, including the provision of spectacles. If this is not possible, the average cost of refraction and spectacles should be kept affordable for parents. Lack of trained eye care professionals is a major challenge in many low-income settings. The key to a successful programme is well trained and dedicated eye care personnel with clearly defined roles and responsibilities. 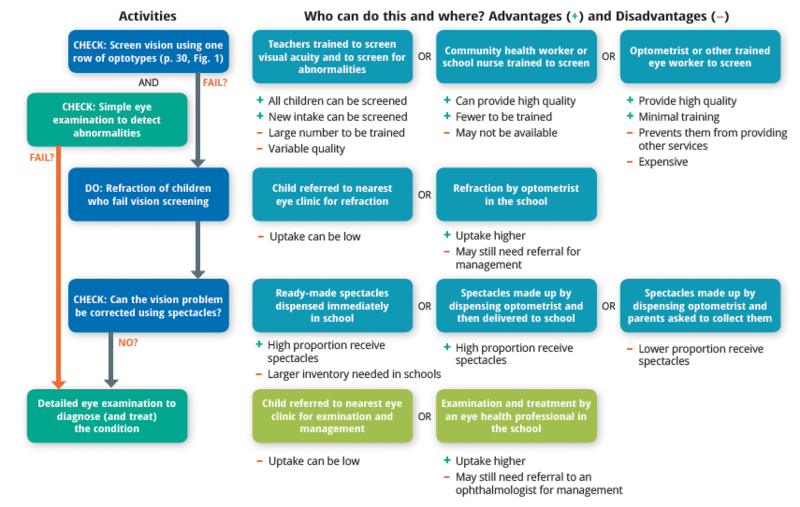 There are several different approaches to delivering school eye health programmes; which approach is adopted largely depends on the personnel available (see Figure 2). Ideally, refraction, prescribing and dispensing should be done in schools, as this improves children’s access. If this is not possible, the next best approach is for refraction and prescribing to be done in the school, with dispensing outside: each child selects the frame they prefer in the school, and the local eye unit makes up the spectacles which are then taken back to the school. Low power spectacles should not be provided, as they are unnecessary and will not be worn. This is a waste of resources and the programme is open to exploitation through unscrupulous prescribing. The article on p. 31 recommends prescribing based on improvement in visual acuity rather than the refractive error. Young children do not have a well-developed bridge to their nose, and spectacle frames for children must be selected and fitted carefully. They must be cosmetically appealing, comfortable and robust enough to withstand normal wear and tear. The lenses must be able to withstand impact. Glass lenses should not be used. Plastic lenses are light, but can become scratched and should be replaced if badly scratched. The success of any programme depends on follow-up. Resources should be allocated to this and systems put in place to follow up all children who fail vision screening or who are found to have an eye condition. Follow-up may be needed after referral for refraction, to obtain spectacles, or for an eye examination at the local hospital or vision centre. Accurate and efficient record-keeping is essential, both by those who are screening and referring and those who are receiving referrals. 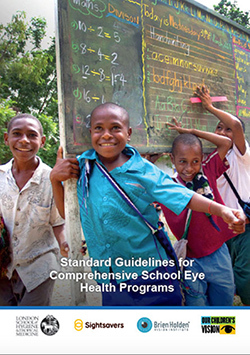 Front cover of the Standard Guidelines for Comprehensive School Eye Health Programmes. The document Standard Guidelines for Comprehensive School Eye Health Programmes has recently been released.3 It provides details on how to plan, implement and monitor school eye health programmes. 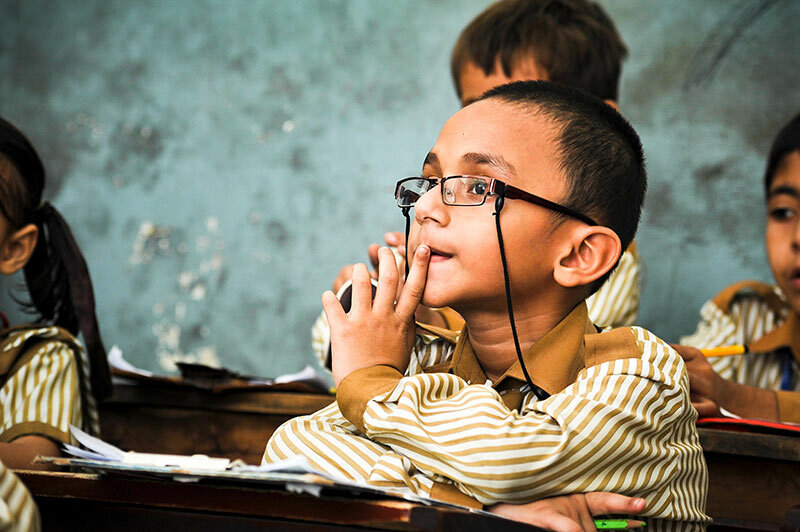 It is hoped that the guidelines will help to standardise school eye health programmes globally. 2 Frick KD, Riva-Clement L, Shankar MB. Screening for refractive error and fitting with spectacles in rural and urban India: cost-effectiveness. Ophthalmic Epidemiol. 2009; 16(6): 378-87.